C1S1CD11 Did you hear the one about the ‘super group’ made up of a member of the Hothouse Flowers, an Irish Folk Artist and the brother of the most famous musician in New Zealand? No? Well I think possibly I was one of the few that bought the album back in 1995 and in hindsight I have to ask myself why? 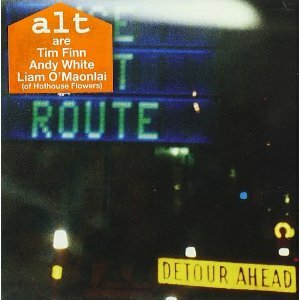 The band were called ALT and consisted of Andy White (A) Liam O Maonlai (L) singer with Hothouse Flowers and Tim Finn (T) brother of Neil Finn, founder of Split Enz and sometime member of Crowded House and claim other name opinions were TAL, TLA and LAT! These songs seem to have been recorded between day jobs in Ireland and Australia and it feels a bit like that. Some songs sound like The Hothouse Flowers and some like Crowded House but when I say that I mean they sound like songs the bands would dismiss as not good enough to record. The recordings here are at best loose in arrangement and at worst they sound no better than some demo’s that need to be developed into fully formed songs. I have been a bit harsh on this album it does have a few decent songs but it’s like mining for gold, you have to sift a lot of crap to find a nugget of any quality. Opener We’re All Men has a Hothouse Flowers feel to it, I Decided To Fly would have been a great 4 minute pop song, unfortunately its over 6 minutes long. It has a couple of less than average instrumentals that add nothing to the album. I suspect that there is a half decent album in here somewhere it just needs a lot of work done on it. In 1995 I guess that at least 2 of the 3 artist featured here could have taken recordings of themselves howling at the moon and got them released and there is a bit of me that thinks it might have been a better listen. This album for me is self indulgent and in truth I expect more from the collective talents of these artists.